Every house has a story to tell. Some homes have stories full of history, drama, beauty and mystery. Other homes tell a story of defiance, decadence or even austerity. Each of these homes is a unique reflection of the folks who built them, the times they lived and worked, how they were used and how they changed over time. When you picture a house with some of these memorable characteristics, what do you think of? Do you think of a massive modern McMansion which is often a huge cube with garish gables and conflicting architectural details tacked on? Or do you think of a well proportioned period home that has stood the test of time? Do you picture a New England connected farmstead with its collection of telescoping additions, ells and outbuildings? Or maybe a humble postwar cape? Anyone who knows me from my writing, teaching or in person has likely heard me go on at length on many of the shortcomings of modern building with respect to to design, materials, size, quality and sustainability. More and more often I keep seeing new homes being thrown up by General Contractors who think they are also designers — they take a stock set of plans, tack on a few dozen more punch list items and ‘upgrades’ that result in a terrible composition and flow and then go on charge an arm and a leg for them. The fact that anyone buys these monstrosities is as sad a reflection on the consumer as it is on that builder. As of late I’ve driven by a few such properties that pained me enough that I took to posting them on my personal Facebook page and critiquing them with like minded friends — often with entertaining and enlightening results. I’m usually trying to espouse several tenets of my own views on traditional building and can often be heard saying “If you don’t buy a poorly designed and executed home, they won’t build them“, “Invest in quality not quantity” and similar things that seem straightforward enough in isolation but are often missed when folks actually go out to buy or build a home. I’m concerned that this sort of message is not reaching enough of the home buying and building public. Thankfully I am not alone in having this view. 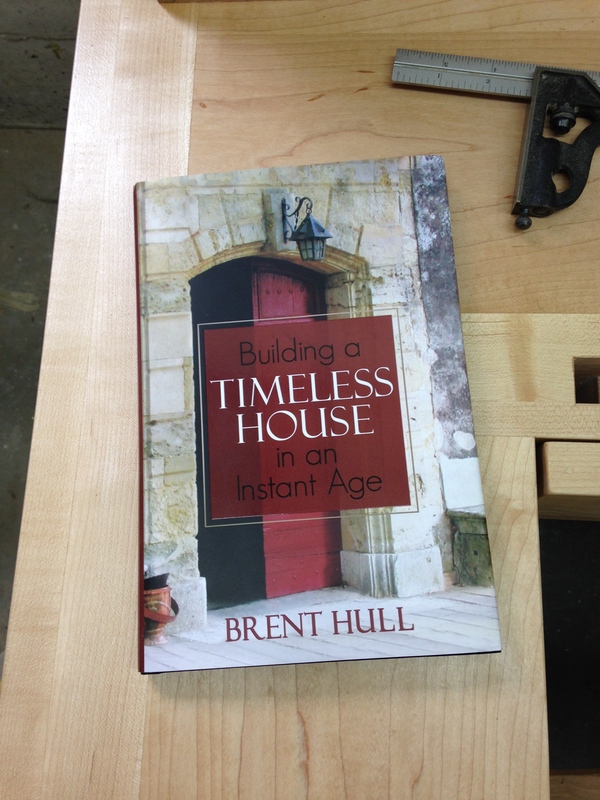 I recently read a copy of Brent Hull’s newest book titled “Building a Timeless House in an Instant Age”. In this book Brent does a great job of articulating the need for consumers to understand the current state of home-building — from track houses, to higher end spec houses and grand mansions and why most houses being built today have lost a lot of what made those earlier houses so memorable and comfortable to live in. This is not a book for the tradesman to learn how to physically build such a house, but it is a thought provoking primer for homeowners and builders to engage in a more meaningful discussion and help get them on the path to building a house that will meet the owner’s needs now and well into the future. He starts with an explanation of how many of the elements we often take for granted — and that are in plain sight — have a strong influence on how we interpret and live in a home. As a preservationist we often play the role of a house detective trying to suss out the story of how this home came to be, how it was situated on the original plot, how it changed over time and how it may have looked at a given time. In order to do this we need to understand how our forefathers built these homes — the tools and techniques as well as the layout and design. Brent goes on to talk about how the Classical Orders of Ancient Greece and Rome were based on the human scale and ideals and how they have had a profound impact on the later design of public and private edifices as well as how we as a society want to project our values and beliefs. When building a ‘Timeless House’ we often have to address the question of how to judiciously make use of modern technology. In the general haste to always use the latest and greatest, or sometimes cheapest new building method or materials to meet a budget or a timeline the house design and/or execution can suffer. As Brent writes “A timeless house does not rely solely on new technology. It is crafted with a combination of products and skill in such a way that it is built to last. Most of these skills are grounded in historic method.” An investment in better design, materials and craftsmanship will yield a better livable, longer lasting and I would argue better selling home if we can educate the public on what to look for and what level of standards to expect. This is similar to the ‘Not So Big House’ philosophy advocated by Sarah Susanka (Sarah’s books are another great resource for homeowners looking to build a comfortable home). Most residential construction today is lacking in architectural design with Architects spending their efforts on the more lucrative commercial market leaving the General Contractors and similar folks to try and fill the void. The Architects working in the residential space are note often well trained in classical orders which further compounds the issue. If you’ve ever visited a home designed by Frank Lloyd Wright you’ll see many of these ideals manifest themselves. I enjoy visiting many of Wright’s Usonian homes which were generally of a modest size but made use of modern and traditional materials, had a strong sense of unifying design, were executed under the supervision of someone who understood the owner’s plans/needs/desires/budget and have stood the test of time. Many of these homes exhibit timeless qualities that are often hard to articulate until you start breaking down the building into many of the aspects Brent covers in his book. How did we lose our way? Since the end of WWII many things have changed in our built environment. There was a pent up demand from the leaner war years, many returning G.I.s looking to start a family, a rapid mechanization resulting from the ever advancing technologies and cheaper transportation means that were being developed and rolled out like that of an assembly line, and a culture that became increasingly materialistic and consumer driven. This perfect storm of circumstances really drove the craftsman from the scene. I grew up on Long Island, NY — about 15 minutes from Levittown which was one of the most iconic instances of production building. These cookie-cutter homes helped a lot of folks get out of the dirty overcrowded city can hopefully lead a better life, but it also lead to sub-urban sprawl and many of its maladies. When folks outgrew their starter cape they simply moved to the next development a few miles further out on the island and repeated the process with another builder. Trading up was encouraged everywhere — do you remember the GM ‘ladder of success‘? — if you were doing well you could trade up from your Chevy to a Buick or a Cadillac. Over time as this model of building became more and more common the average house became a poor approximation of what earlier generations produced. These modern homes were assembled rather than crafted, built from commodity materials that were designed to be replaced as a unit when they failed — rather than being fixed — and leaving many of the homes a rather boring set of boxes with simple trim that was often dictated by price and supplier availability rather than for aesthetic value or historic precedent. So how do we avoid all this doom and gloom? The solution is education. The book calls out many very good resources for how consumers can educate themselves on what sorts of designs, styles and products they want to include in their homes. He also defines strategies that will help you focus in on what you are looking for, how to articulate it and how to evaluate the folks you decide to include on your team that will help make it all come together. I’m glad to see that this book was written and I encourage anyone who desires a Timeless House to check out the book and then get out there and start exploring — drive around older neighborhoods and note the things you like. Travel to other locales. Talk to folks you see doing good craftsmen oriented work. Follow blogs that are interesting to you, note pictures you like on Pinterest, Houzz and similar sites. Talk with local preservation groups. All these data points will help you refine what you are looking for and get you on the path to something better. Go out and tell a story with your home. Brent is a friend of mine and a fellow graduate of the North Bennet Street School’s Preservation Carpentry program. Since graduating from NBSS Brent has gone on to develop a nationally recognized Architectural Millworks and Historic Preservation company call ‘Hull Historical Architectural Millworks‘ which is based out of Texas. He is the exclusive millworks supplier for DuPont’s Winterthur and has worked on many public and private projects that have resulted in many awards and accolades over of the years. You can read a bit more about him in an earlier blog post I wrote here, and you can see what he’s been up to on his blog here.